SoundCloud has launched its subscription service SoundCloud Go in the UK & Ireland. The service will retail for £9.99 in the UK and €9.99 in Ireland. SoundCloud Go is similar to Spotify's Premium price plan, which removes adverts and allows tracks to be downloaded for offline listening. The news follows the launch of the service in the USA last month. SoundCloud says the service grants users access to a whopping 125 million tracks. By comparison rival streaming service Spotify has 30 million tracks and Tidal has 40 million. SoundCloud's larger library is down to the fact the service allows anyone to upload songs. The site has become popular with unsigned artists as a means of making their songs available quickly to a wide audience. The changes to SoundCloud's business model mean that artists with tracks on the service will receive royalties based on the amount of plays their tracks receive, benefitting established and emerging artists alike. For those who aren't interested in paying a monthly subscription fee, SoundCloud will continue to be free and will be supported by ads. Advertising is not new to the service, having been launched by SoundCloud in August 2014. In addition to audio ads, SoundCloud will also be supported by in-stream native ads, promoted profiles and creative partnerships. The £9.99 price point is equivalent to Spotify's higher-end Premium price tier whilst also matching Tidal's lower-tier offering. 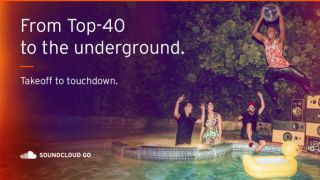 SoundCloud Go is available from today and includes a 30-day free trial.